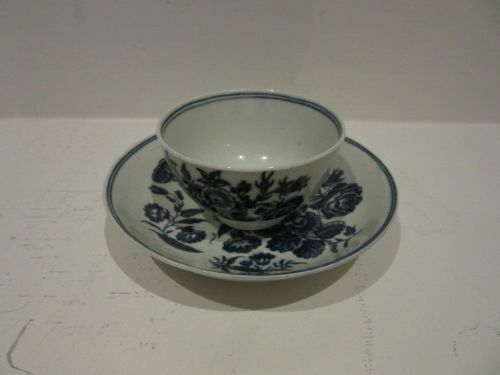 A 1st Period Worcester Teabowl And Saucer With Printed "Three Flowers" Decoration. A 1st period Worcester teabowl and saucer, with underglaze blue and white "Three Flowers" printed decoration. 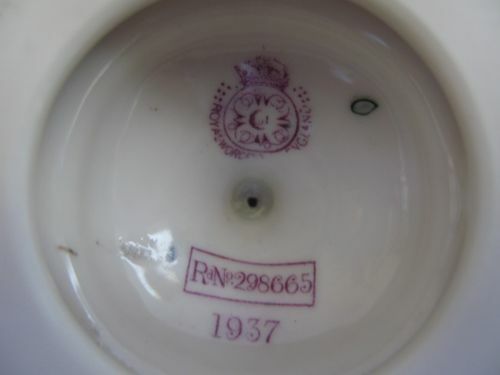 The teabowl measures approximately 3"diameter x 1.3/4"tall and the saucer 5"diameter x 1"tall, and both have the factory hatched crescent mark for circa 1775. 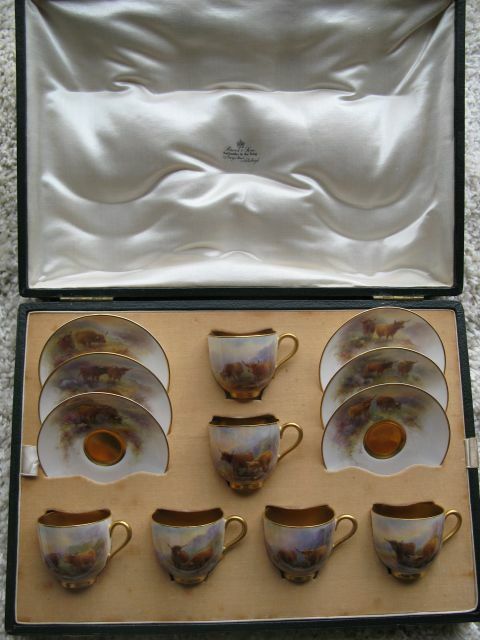 They are in very good condition with no damage, crazing, chips or restoration. 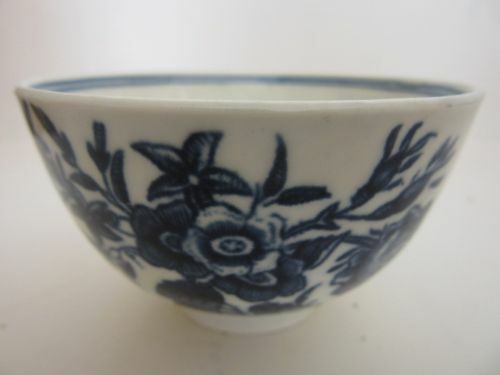 A 1st Period Worcester Teabowl with "Three Flowers" Decoration. 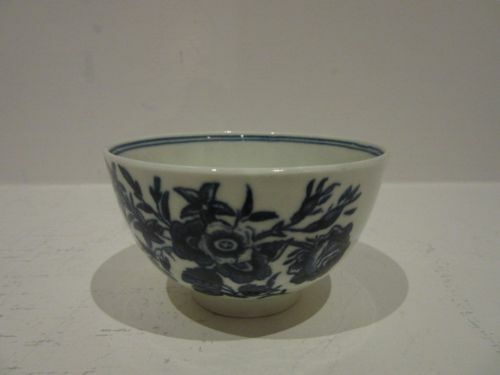 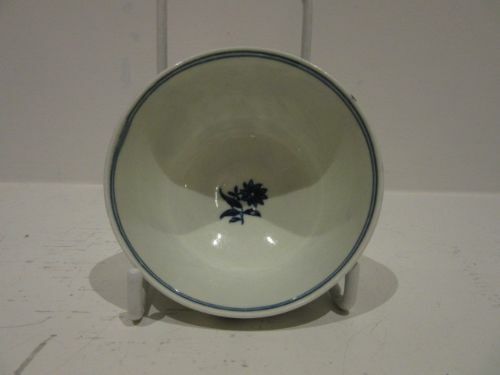 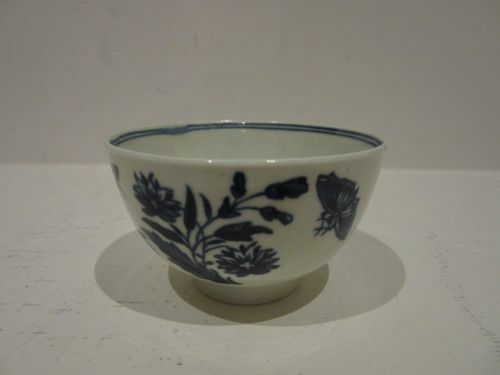 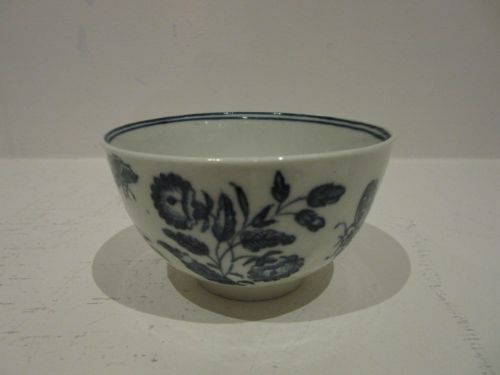 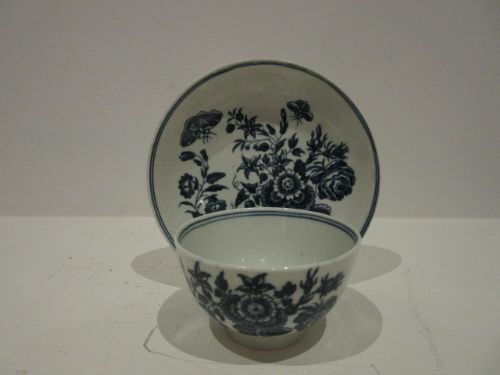 A 1st period Worcester porcelain teabowl, with underglaze blue and white "Three Flowers" pattern, printed decoration. 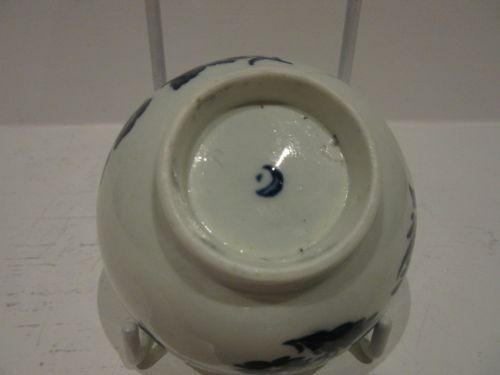 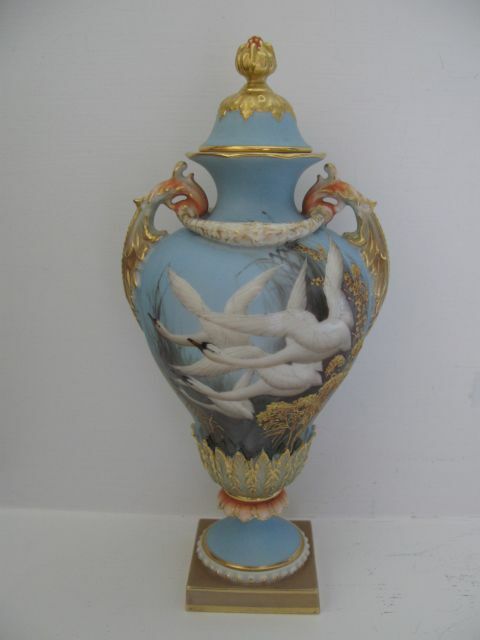 Measuring approximately 3"diameter x 1.3/4"tall, it has the factory hatched crescent mark for circa 1775 and is in very good condition with no damage, crazing, chips or restoration. 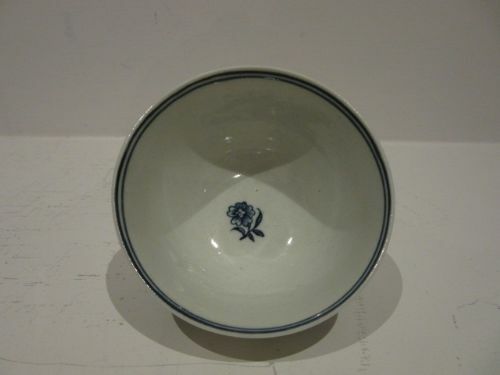 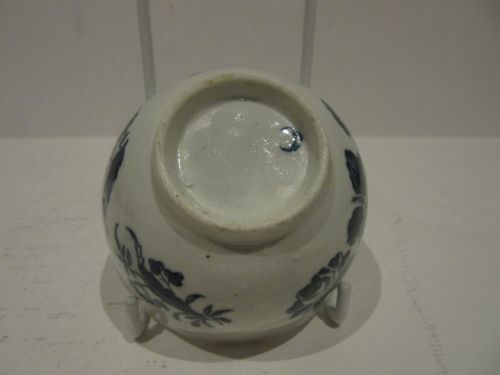 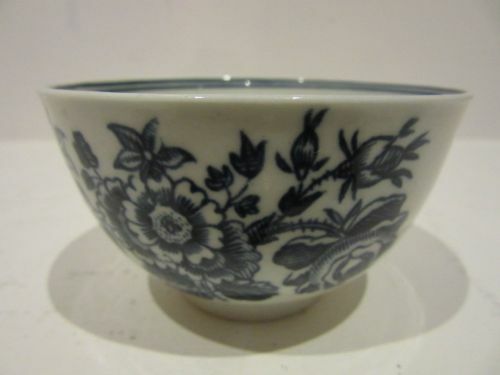 A 1st Period Worcester Teabowl With Printed "Three Flowers" Decoration. 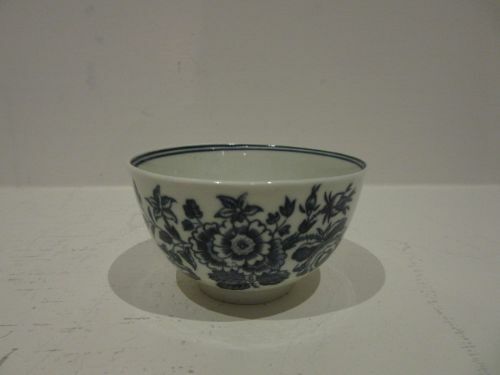 A 1st period Worcester porcelain teabowl, with blue and white underglaze "Three Flowers" pattern printed decoration. 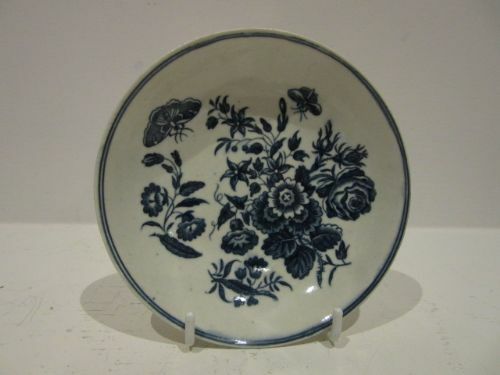 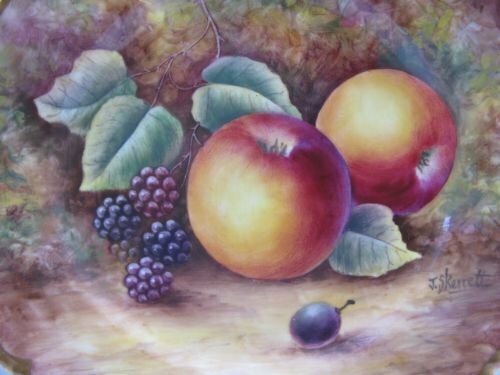 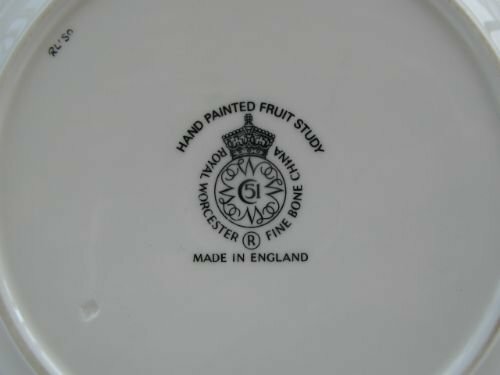 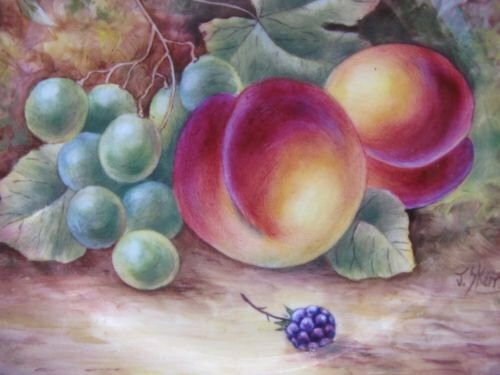 A 7.3/4" Diameter Royal Worcester Fruit Painted Plate By J. Skerrett. 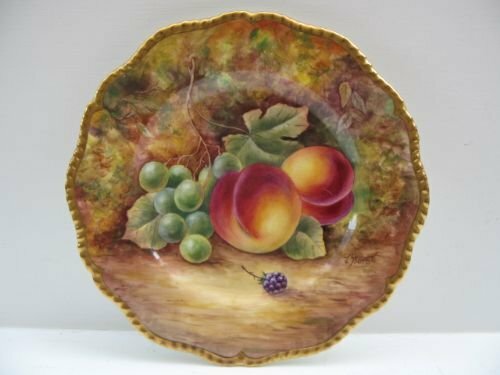 A Royal Worcester porcelain plate with heavily gilded shaped edge, and fruit painted decoration by James Skerrett. 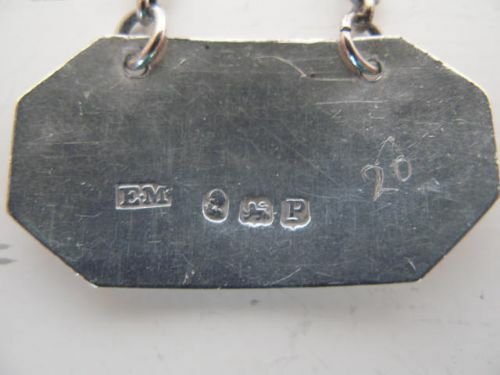 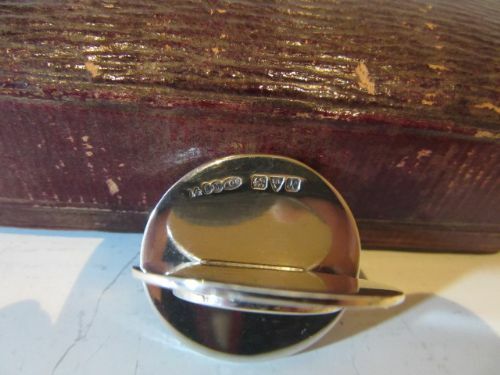 Measuring approximately 7.3/4"diameter and with the black factory stamp for the last quarter of the 20th century, it is in excellent condition with no damage, crazing or restoration, and the gilding is unworn. 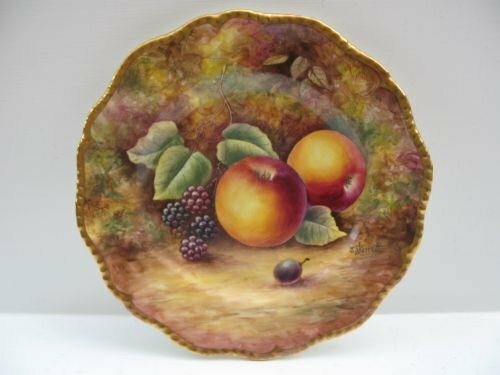 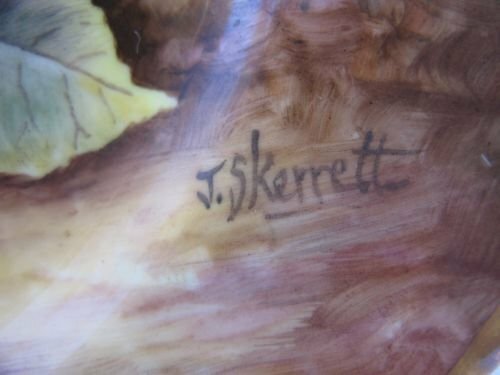 A 7.7/8" Diameter Royal Worcester Fruit Painted Plate By J. Skerrett. 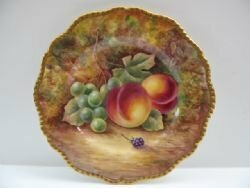 A Royal Worcester porcelain plate, with heavily gilded, shaped edge and fruit painted decoration by James Skerrett. 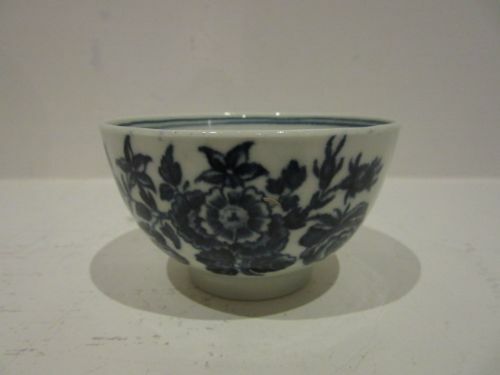 Measuring approximately 7.7/8"diameter and with the black factory stamp for the last quarter of the 20th century, it is in excellent condition with no damage, crazing or restoration, and the gilding is unworn. 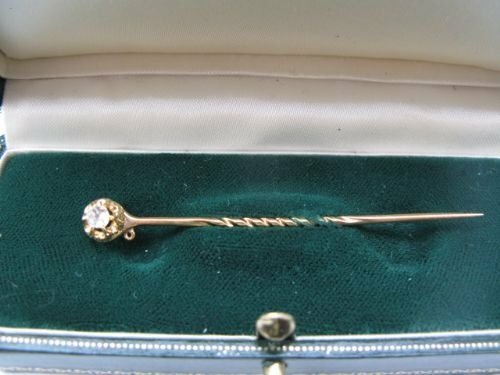 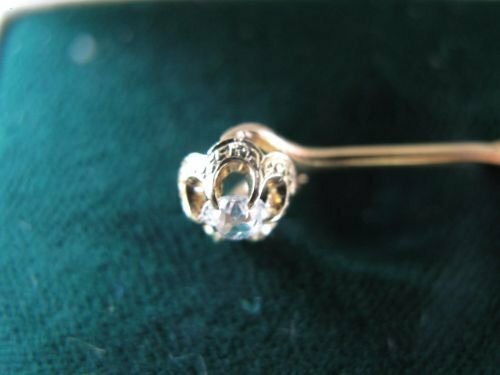 A 9 Carat Gold & Diamond Stick Pin. 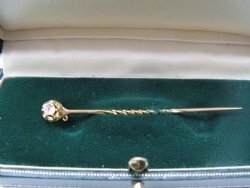 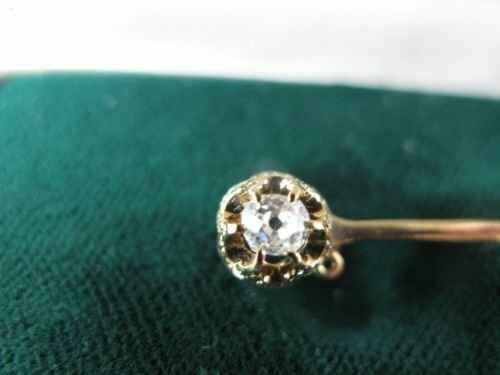 A good, 9 carat gold (tested) and natural diamond stick pin, the diamond of approximately 0.15 carat weight, "I/J" colour and VS1 clarity. 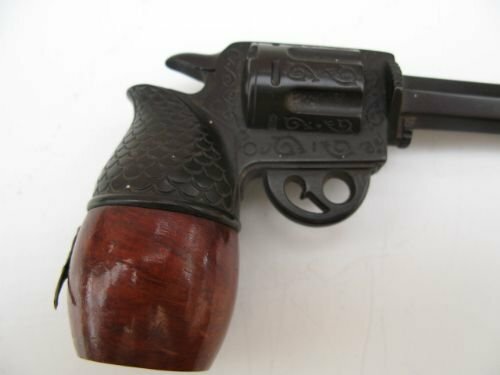 Overall length 60mm, circa 1930. 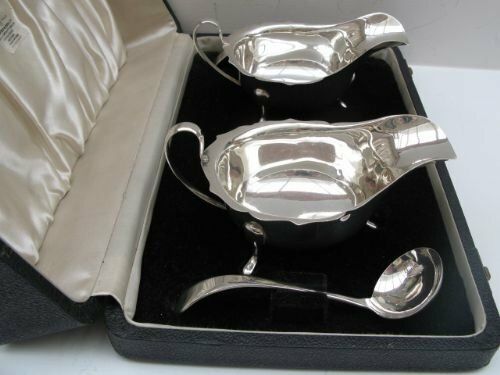 A Boxed Pair of Solid Silver Sauceboats And Ladles. 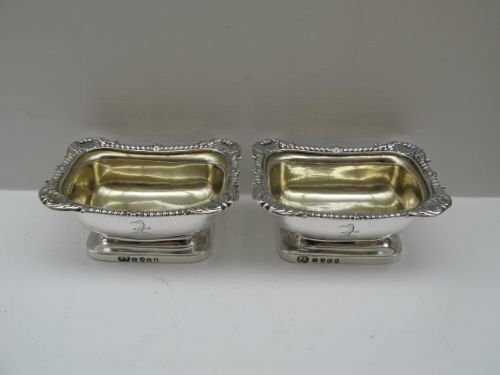 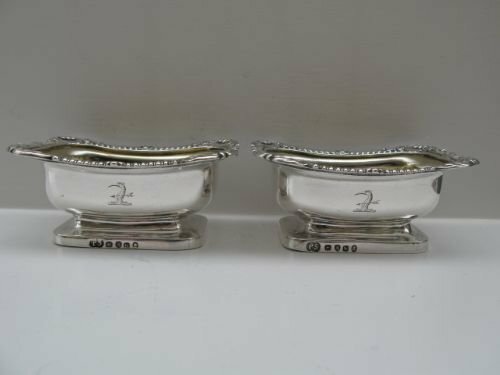 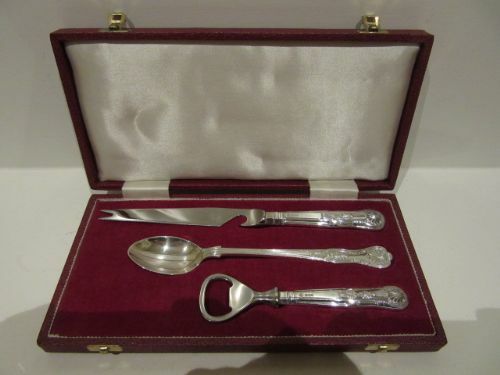 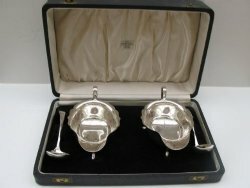 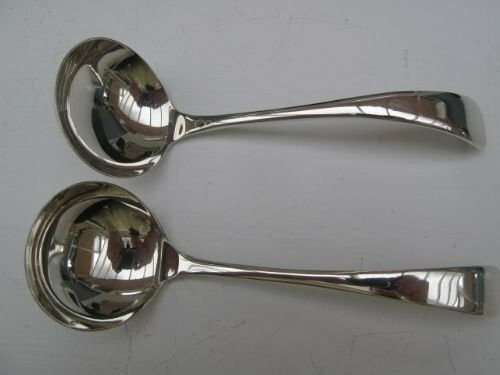 A nice pair of silver sauceboats and ladles in their original retailers box. 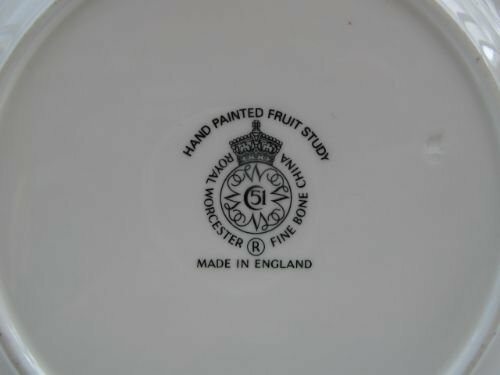 With well struck hallmarks for Sheffield 1939 and 1940, they are in good condition with no damage or repair, and very little sign of use. 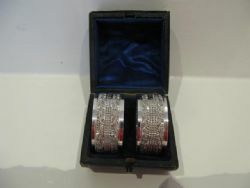 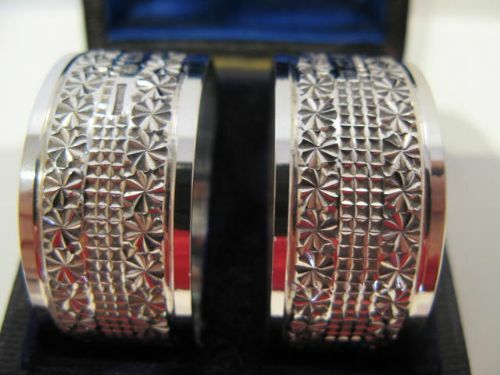 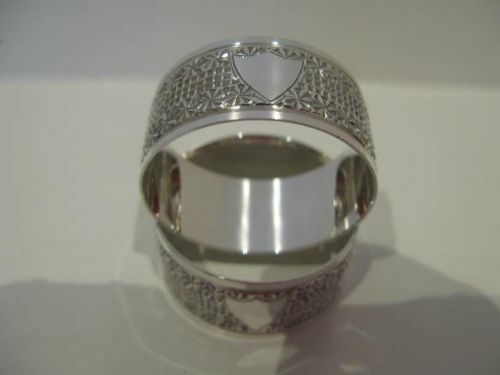 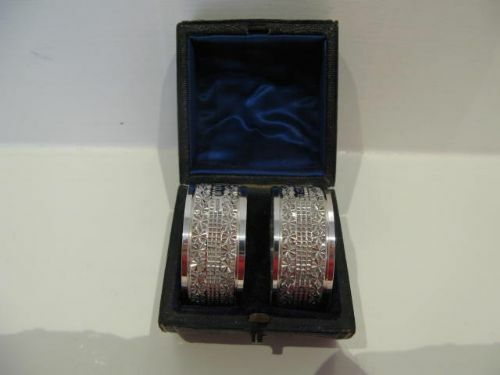 A Boxed Pair Of Victorian Silver Napkin Rings, Birmingham 1900. 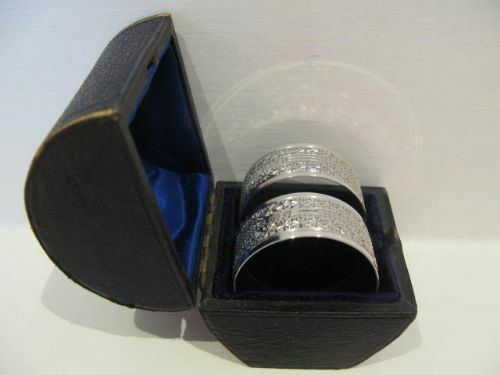 A very pretty boxed pair of Victorian, solid silver bright cut napkin rings with vacant cartouches which have never been personalised. 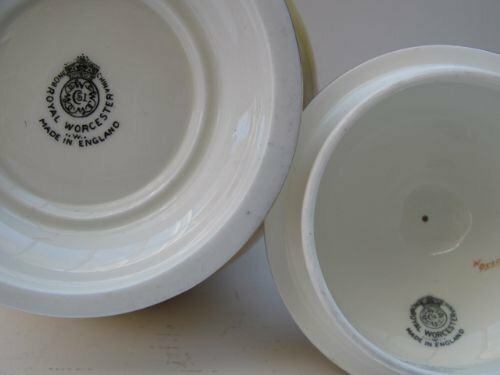 Measuring approximately 1.5/8"diameter x 3/4"deep, they have clear, well struck hallmarks for Birmingham 1900 by IG&SLtd and are in fine condition with no damage or repair. 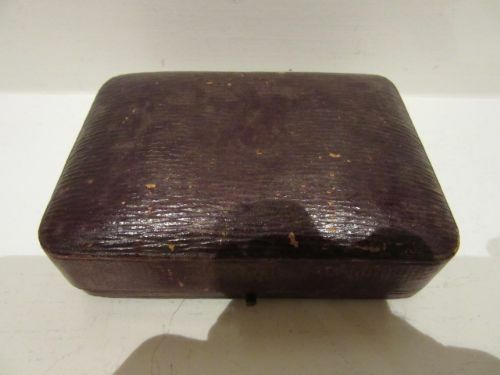 The box, which appears to be original, is in decent servicable condition with the catch closing firmly, but the leatherette(?) 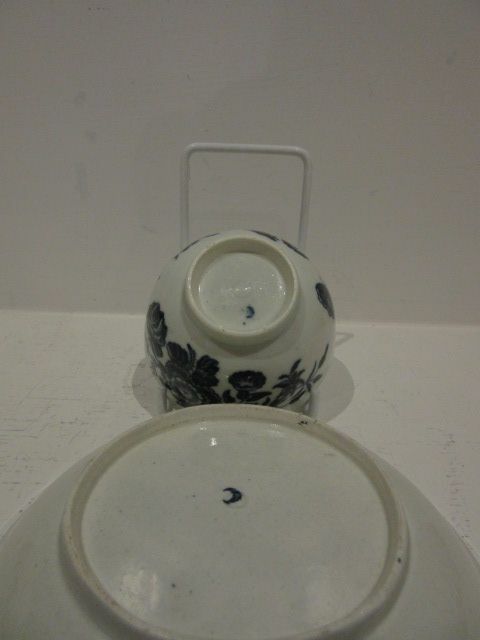 exterior is faded and scuffed in parts. 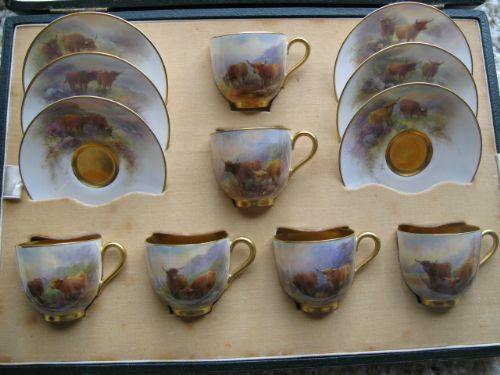 A Boxed Set Of Six Royal Worcester Demi-Tasse Cups And Saucers, Cattle Painted By Stinton. 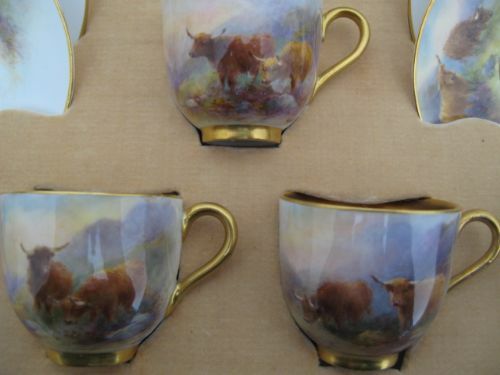 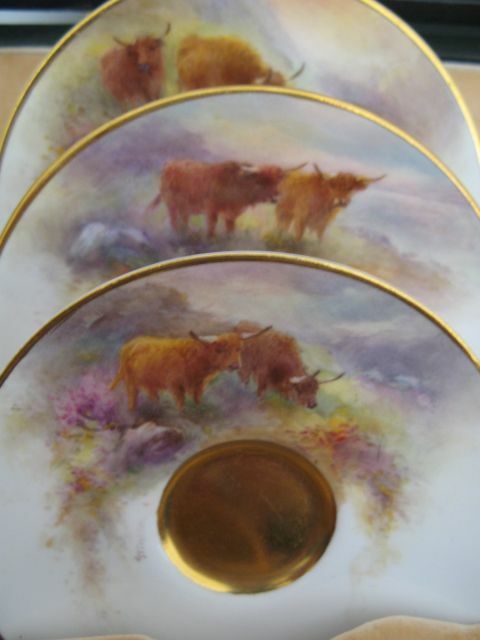 A lovely, boxed set of six Royal Worcester demi-tasse cups and saucers, all with well painted scenes of Highland Cattle in mountainous Scottish settings and all signed Stinton, the style and signature being that of Harry rather than John. 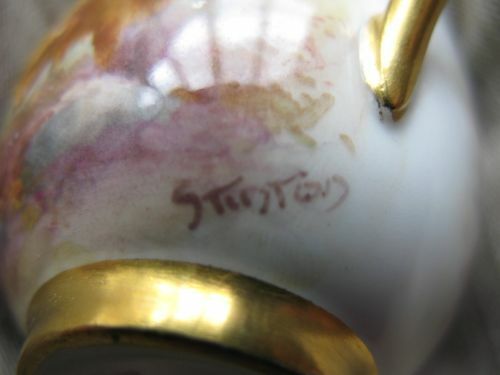 They all carry the puce factory stamps for 1936/7 and are in excellent condition having presumably spent most of their lives in their fitted case, and have no damage, crazing or restoration and the gilding is all in good order. 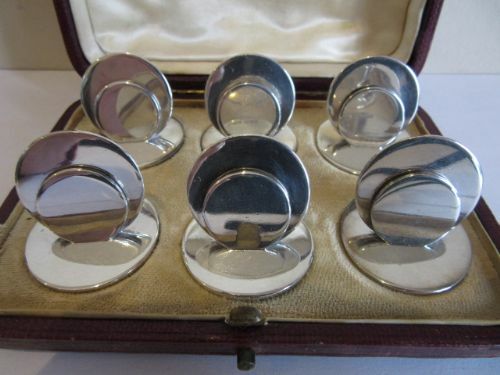 A Boxed Set Of Six Silver Place/Menu Holders, By SAMPSON MORDAN & COMPANY. 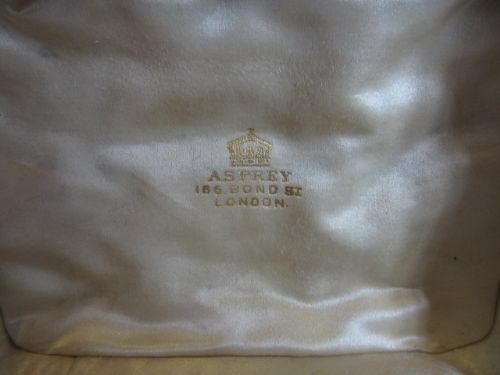 Retailed By Asprey. 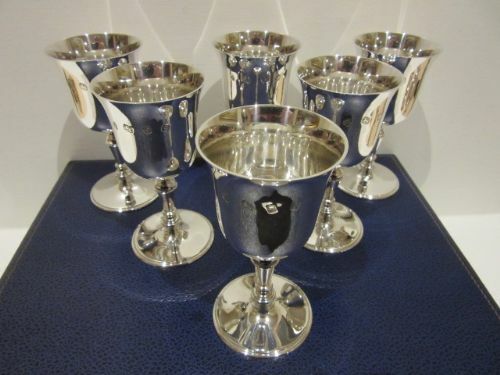 A good set of six solid silver place or menu holders in their original Asprey of Bond Street retailers case. 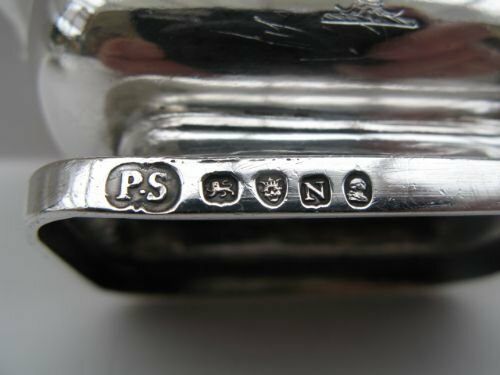 Measuring approximately 1.1/4"diameter at the bases and standing 1.1/8"tall, they are all well hallmarked for Chester 1913 by the renowned Sampson Mordan & Company and are in excellent condition with no damages, dents or solder repairs and the hallmarks are all clear and well struck. 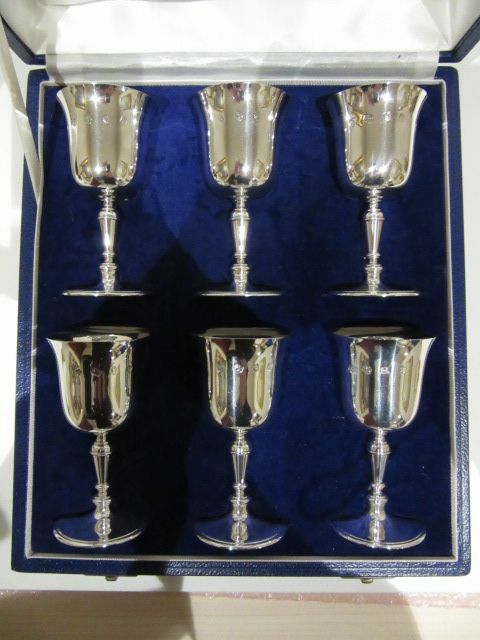 A Boxed Set Of Six Silver Wine/Sherry Goblets, London 1971. 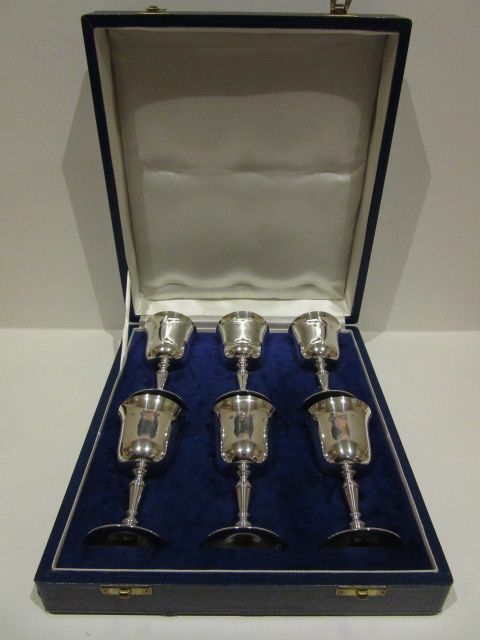 A good boxed set of 6 solid silver wine or sherry goblets, all hallmarked for London 1971 by C J Vander Ltd. 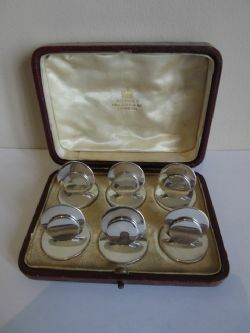 Measuring approximately 2.1/8"maximum diameter x 4.1/4"tall and weighing a total of 22 ounces, they are fully hallmarked for London 1971 by C. J. Vander Ltd, and are in excellent condition with no damage, dents or solder repairs, and their fitted box is also in 1st class condition. A Boxed Silver Cocktail Set In Its Original Box. 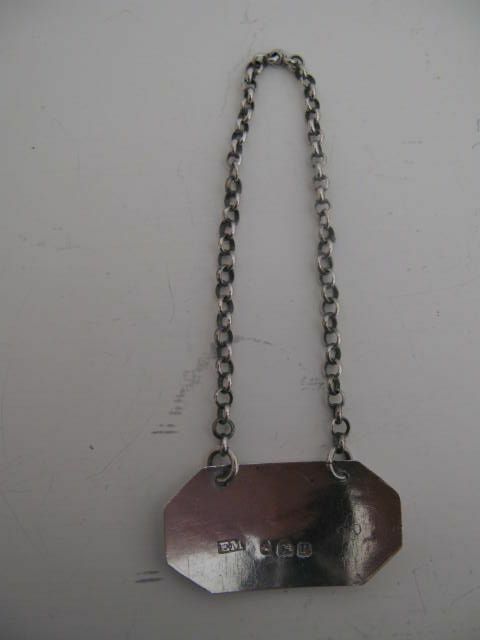 Sheffield 1972/1973. 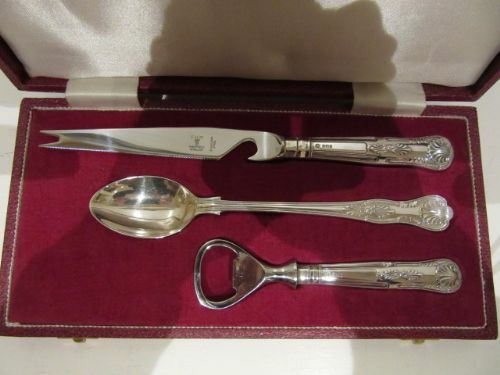 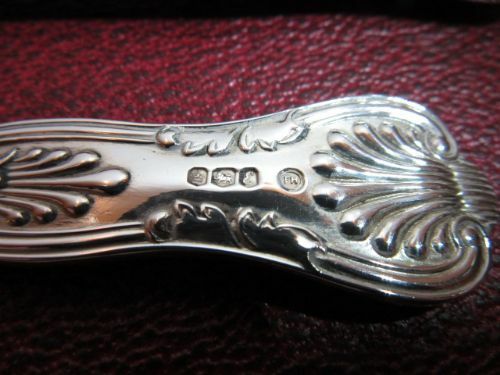 A useful silver cocktail set comprising a serrated stainless steel bladed knife with silver handle for cutting lemon or lime slices, a 7.1/2" long solid silver teaspoon for stirring and a silver bottle opener. 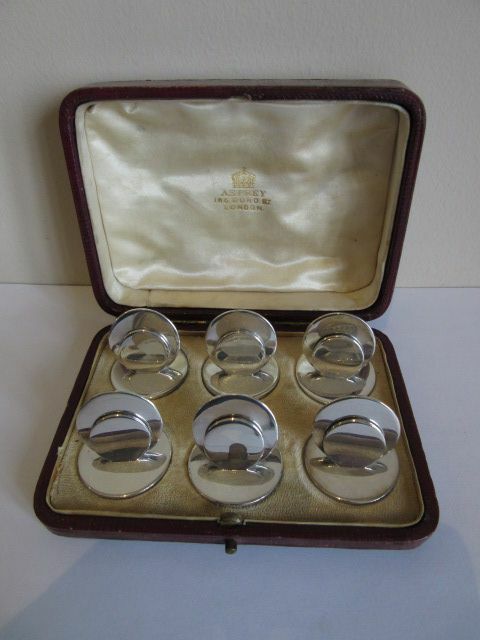 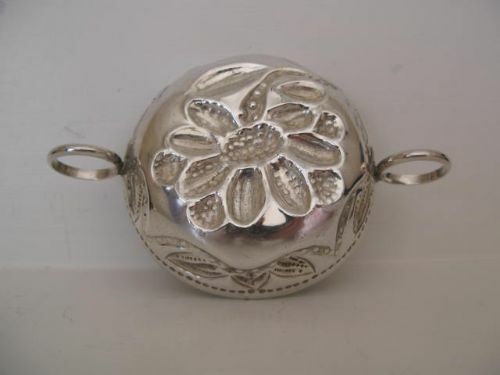 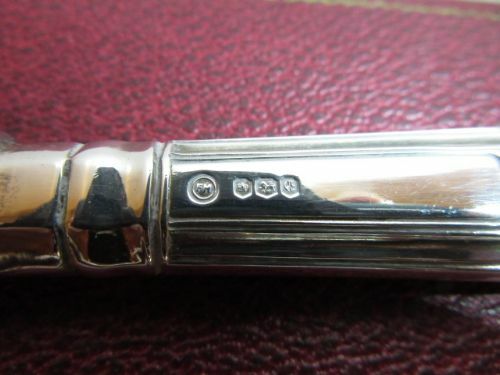 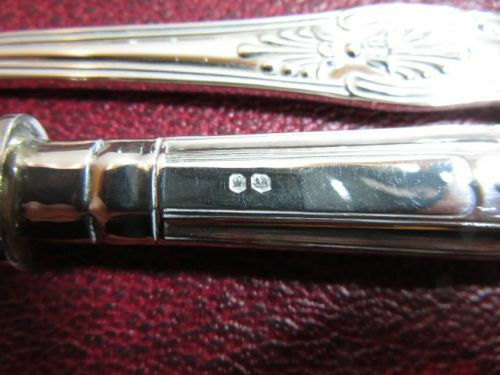 They are all hallmarked for Sheffield 1972/1973 by Francis Howard Ltd, and having spent most of their lives in their original fitted case, they are in absolutely excellent condition with no damage, dents or repairs. 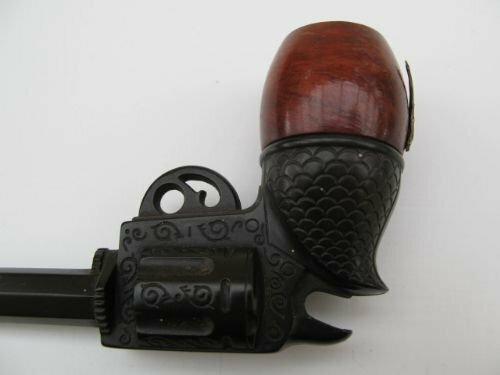 A Briar And Bakelite Novelty Pipe. 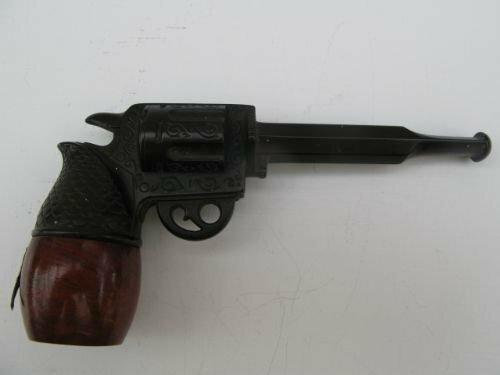 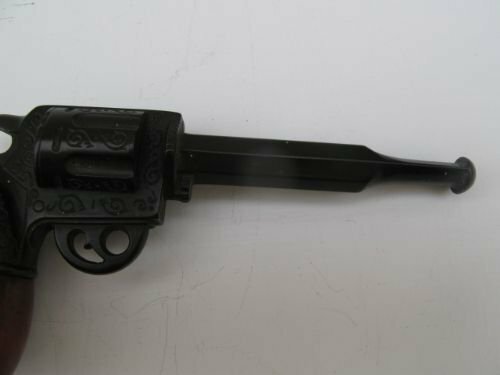 A lovely old briar and bakelite novelty pipe in the form of a revolver. 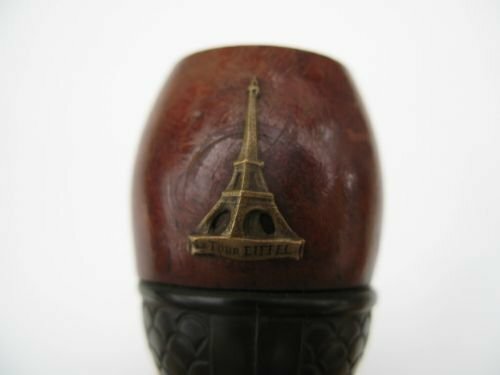 Never been smoked, and probably a souvenir from the 1930's in Paris. A Bristol Blue, Victorian Double Ended Scent Bottle. 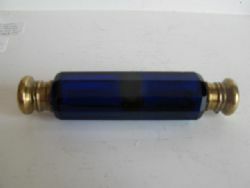 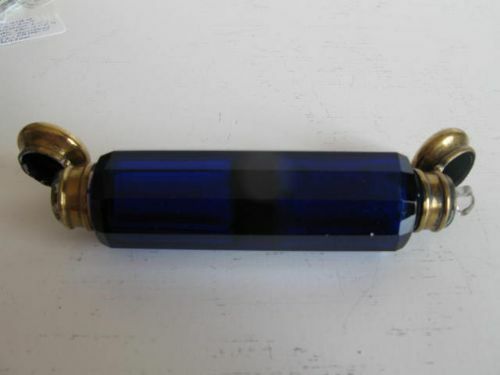 A Victorian, ten-sided Bristol blue double ended scent bottle, with hinged brass covers and one end with clear glass stopper. 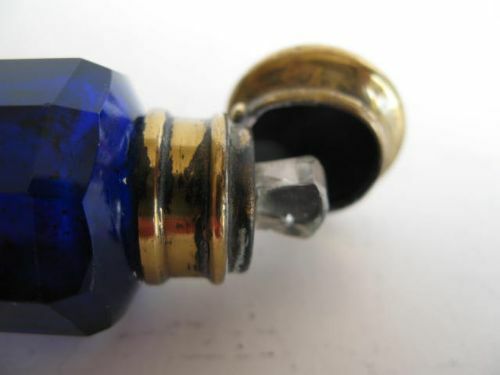 Dating to circa 1880 and measuring approximately 5"long x 1.1/8"across the flats, is in nice condition with both hinges working correctly and the glass of attractive deep colour, with only a few light scratches and a couple of small nicks to the edge of one facet. 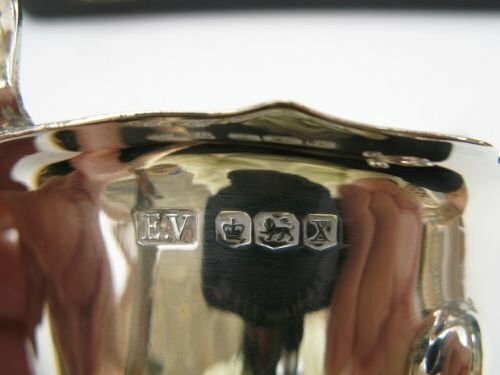 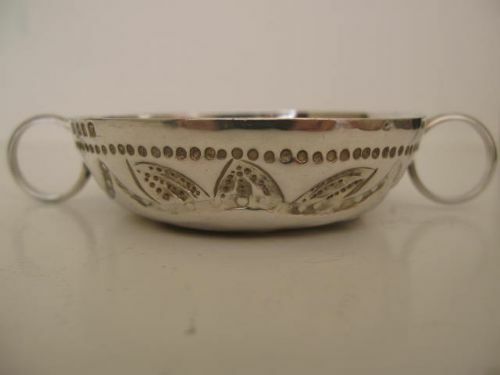 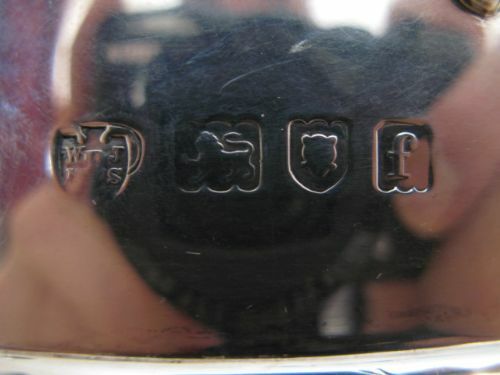 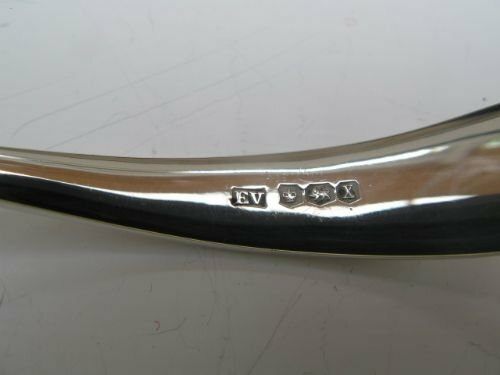 A Britannia Standard Solid Silver "Tasse A Vin" London 1912. 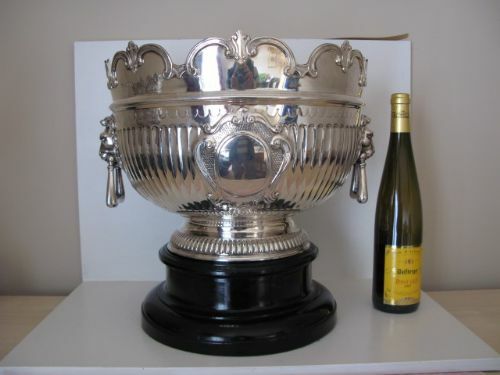 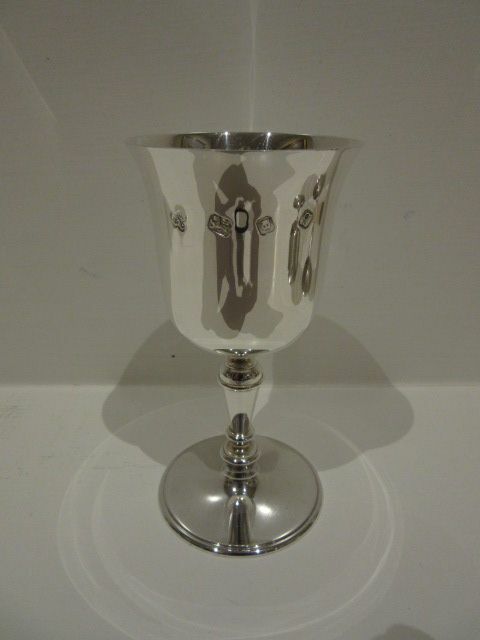 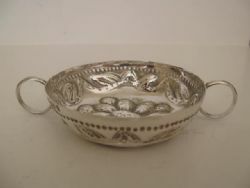 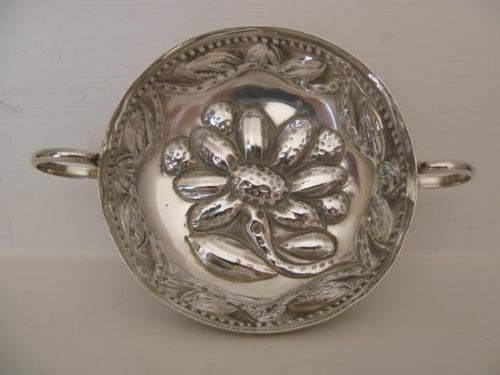 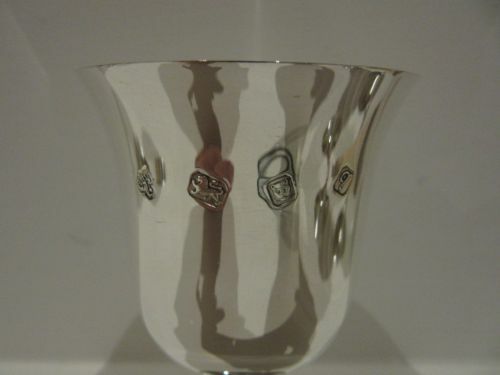 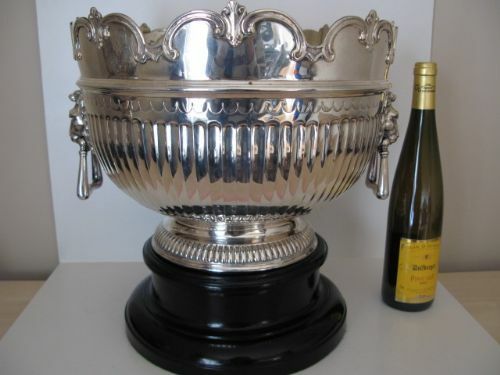 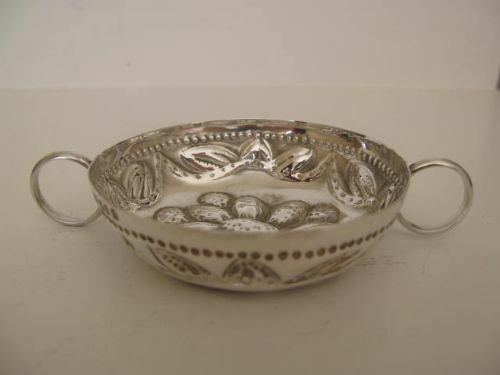 A good quality solid silver wine tasting two handled cup, manufactured from Britannia standard silver which is the higher grade of purity English silver. 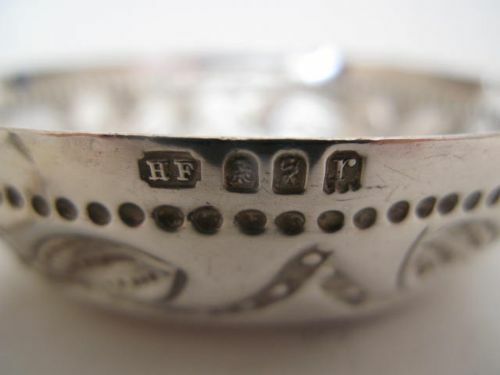 It measures approximately 5" diameter over the handles(3.1/4" excluding the handles) x 7/8"deep, with hallmarks for London 1912 by "HF" and is in very good condition with no damage or repairs and the hallmarks are well struck and without rubbing. 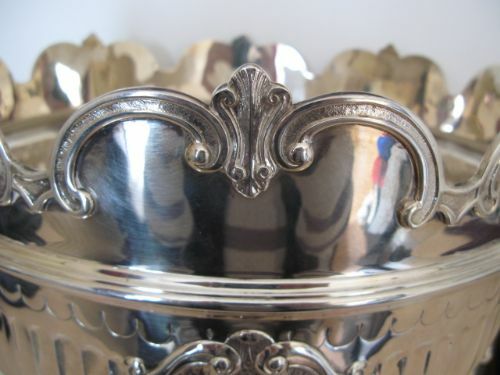 A Fine And Substantial Victorian Silver Monteith, London 1901 Weighing 124 Ounces!!! 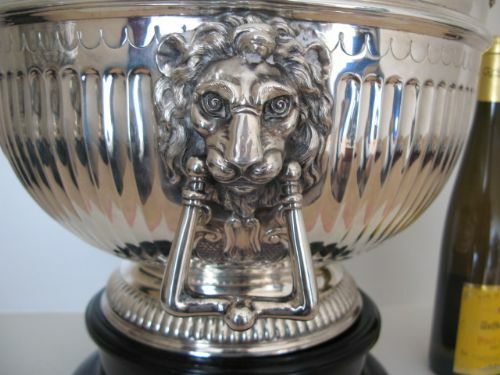 A massive, Victorian solid silver monteith style punchbowl with arcaded rim and half fluted body, a vacant cartouche which shows no signs of ever having been engraved and a super pair of well modelled, cast silver lion-mask handles. 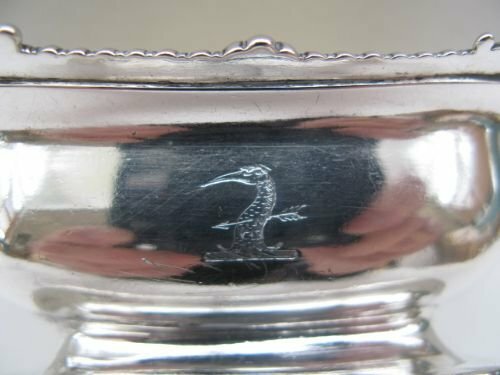 Measuring 14.1/2"diameter x 10.3/4"tall excluding the ebonised plinth, it is hallmarked for London 1901 by Edward Barnard & Sons and is without damage or repairs and again excluding the plinth, it weighs a huge 124 avoir ounces on standard scales which converts to 113 troy ounces. Monteiths of this size and quality are seldom seen on the open market. 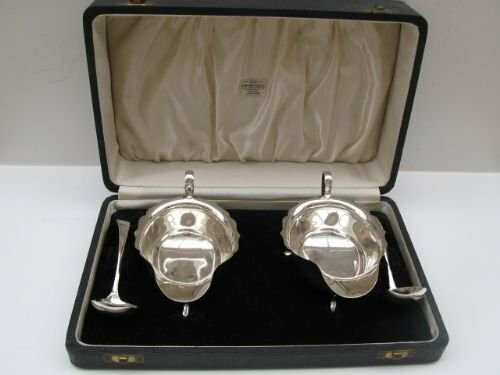 A Fine Pair Of George III Silver Salts By Paul Storr. 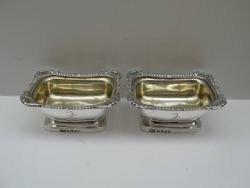 A lovely quality pair of crested, George III solid silver salts with applied cast rims, gilt interiors and well struck hallmarks for London 1808 by Paul Storr. 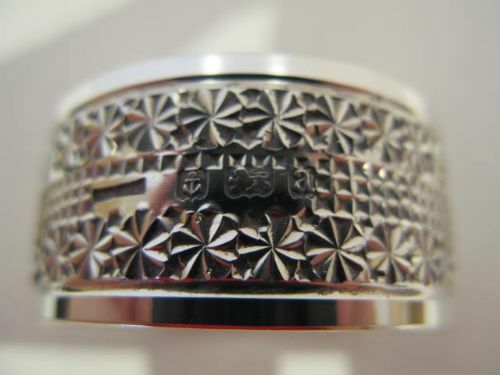 They are of substantial size, measuring approximately 3.3/4"long x 2.7/8"wide x 1.5/8"tall and manufactured from a heavy gauge of metal, weighing 4.55 troy ounces each. 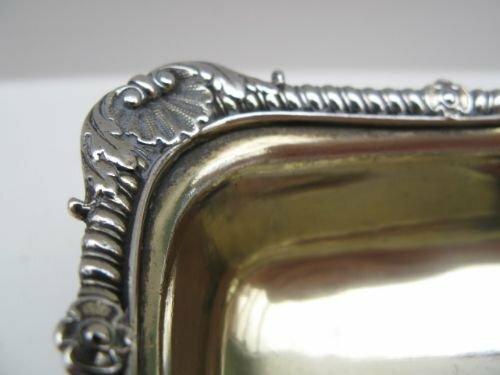 With only a few minor scratches to the gilt interiors, they are in excellent condition with no damage or repair, and only slight signs of use. 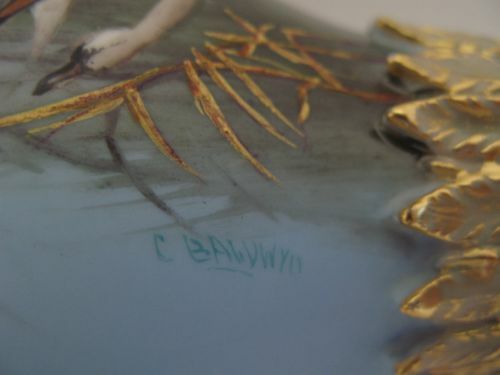 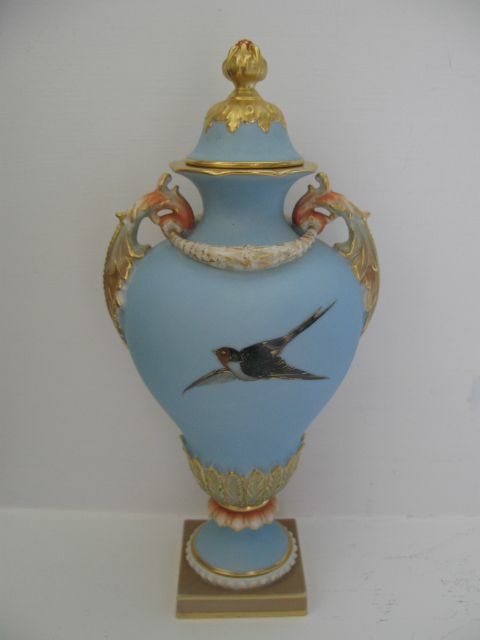 A Fine Royal Worcester Swan Painted Vase By C. Baldwyn. 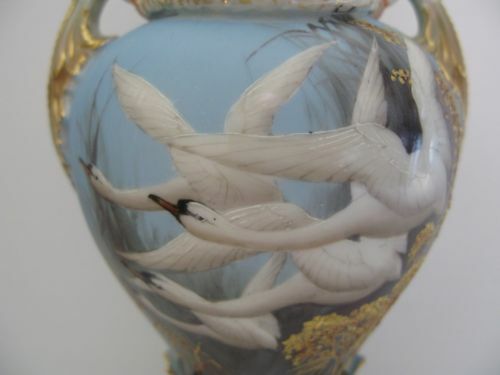 A Royal Worcester porcelain lidded vase, shape number 1937, with a superbly painted depiction of four swans in flight by Charles Henry Clifford Baldwyn who specialised in bird painting, particularly swans and small birds, and is widely regarded as one of Worcesters finest artists. 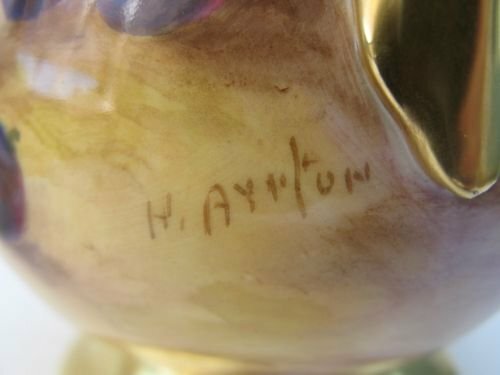 Standing approximately 9.1/2"overall height x 4.1/2"wide, it has the puce factory stamp for 1903 and is in excellent condition with no damage, crazing or restoration, the gilding is fresh and unworn and it could truly be described as being of museum quality. 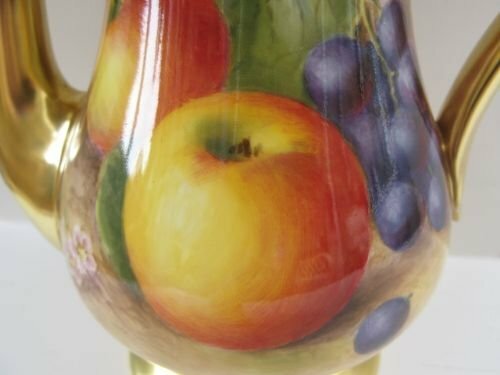 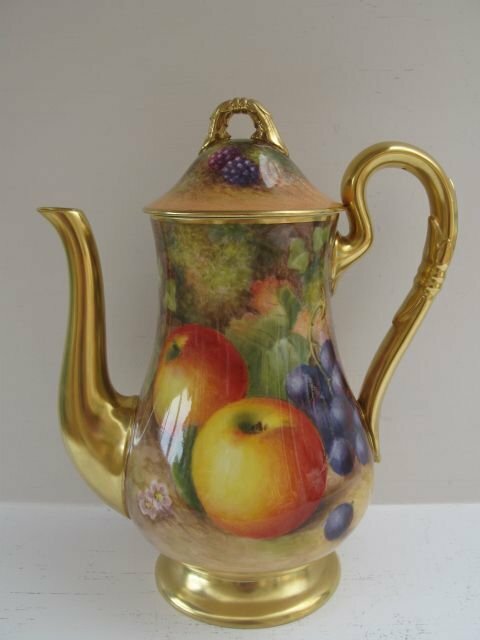 A Full Size, Royal Worcester Fruit Painted Coffee Pot By H. Ayrton. A fine, full size Royal Worcester coffee pot, with well painted fruit decoration by Harry Ayrton. 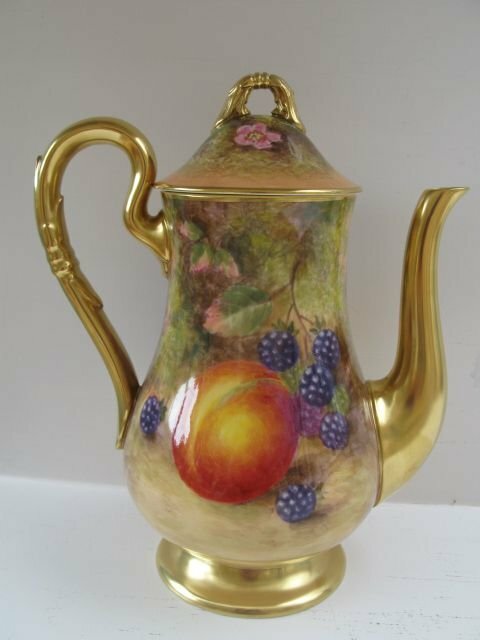 Standing approximately 8.1/4"overall height x 7"wide from handle to tip of the spout, it has the black factory stamp to both the lid and the pot for 1954+5 and is in absolutely 1st class condition with no damage, crazing or restoration, and the gilding is probably as good as the day it was made. 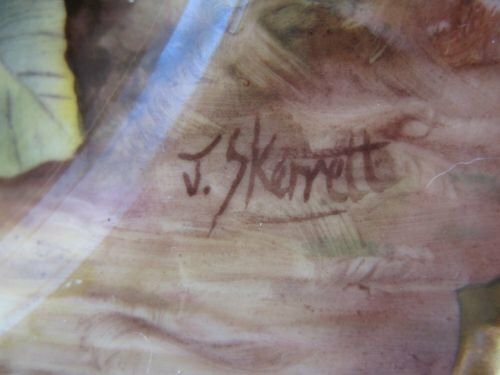 (Apologies for the apparent vertical lines on some of the pictures, but it was a very sunny day and these are all reflections). 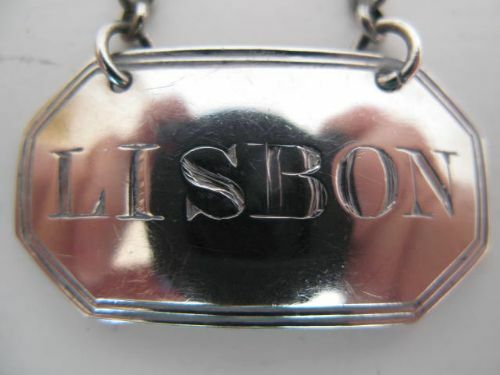 A George III Silver "Lisbon" Bottle Label By E. Morley. 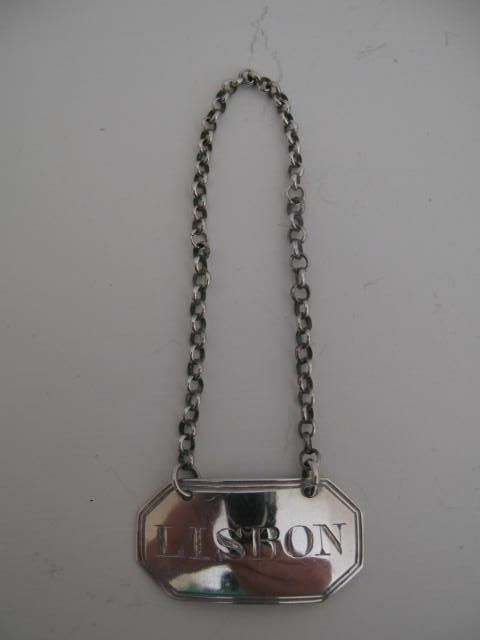 A George III solid silver "Lisbon" bottle label with reeded edge by Elizabeth Morley, hallmarked for London 1810. 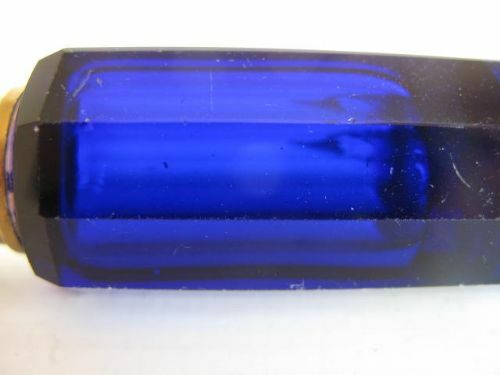 Measuring approximately 1.1/2"long x 3/4"wide, it is in very good condition with no damage or repairs and the hallmarks are well struck and easily read.